From the Dawgnation and beyond. Headlines from the weekend. Why is every Terrence Moore article anti-UGA? What does he have against us? PW, The week before GT can we have retarded cousin week? They are no kin of mine. Speaking of the Herbie Awards. How is that we have so many players on these lists, most ranked better than UFs (when they even have one)and he picks them to win the East the Conference and the MNC? That seems strange to me but I guess its not really surprising. how do i know the tickets i am buying are real and im not getting scammed? any info is helpful. 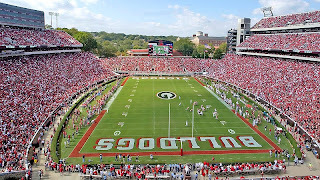 SRQDawg15... Herbie stated on saturday he doesn't like UGA's Schedule while Florida has a very Easy schedule. He also call Stafford the best QB in the country. I think he was smitten with Stafford after the Elite 11. Video link now up on AJC.com that features Moore stating that letting Knowshon return kicks/punts is "lunacy," and UGA will lose at least three games. The other guy in the video is rendered nearly speechless. You say Florida will win the SEC and MNC...I say fine. You're wrong but you're entitled to your opinion. Then you say Ole Miss is the sleeper to win the West. What the f*** are you thinking? You have just lost what tiny shred of credibility you had left. I like Jevon Snead and for some reason beyond all human comprehension I like Houston Nutt. But to give them any shot of winning the West is sheer lunacy. Alabama as the sleeper...maybe. Miss.St. maybe if you're just being wildly impractical. But tell me, oh wise one, other than Oher and Snead just how is Ole Miss going to win a substantial number of games against Wake Forest (Away), Florida (Away), South Carolina (Home), Alabama (Away), Auburn (Home), and LSU (Away). You say Georgia's schedule is too hard commensurate with our talent and then give us this garbage. You, sir, are on crack...and need to pass some down to your buddy Lou Holtz so he stops jinxing the Dawgs. If it doesn't work, go to ajc.com, then go to sports and it's one of the main stories. By the way, the "other guy" in the vid is Bill Hartman, son of the UGA legend. Terrence Moore...does your stupidity hurt? Yeah...I like how Herbie says they must visit Athens again. That it's been too long. Herbie, the next time you're doing Gameday, turn your head 90 degrees to the right. Look for the dark-haired jackass named Chris sitting smugly next to Mr. Corso. HE is the reason you guys haven't been back and you know it. Unfortunately, for Mr. Fowler...the SEC/ESPN deal ASSURES that the Gameday crew will be REQUIRED to visit Athens at least every couple of years. I've been writing over and over since last season that ESPN needed us more than we needed them.